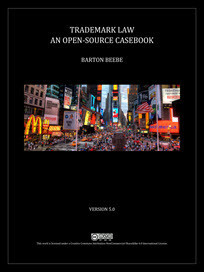 Trademark Law: An Open-Source Casebook is a free, “open” textbook designed for a four-credit trademark course, which is what I teach at NYU School of Law. Model syllabi for four-credit and three-credit courses are available in the Faculty Resources section of this website. All faculty teaching trademark law are welcome to access the Faculty Resources, including the faculty discussion forum, by becoming a registered user of the site. To register, write me at barton@bartonbeebe.com. The casebook is made available under a Creative Commons Attribution-NonCommercial-ShareAlike 4.0 International License. In slightly simpler terms, this means that you are free to copy, redistribute, and modify the casebook in part or whole in any format provided that (1) you do so only for non-commercial purposes, (2) you comply with the attribution principles of the license (credit the author, link to the license, and indicate if you’ve made any changes), and (3), in the case of modified versions of the casebook, you distribute any modifications under the same license.